I went through this period back in the early to mid 90's of collecting vintage smoking paraphernalia. 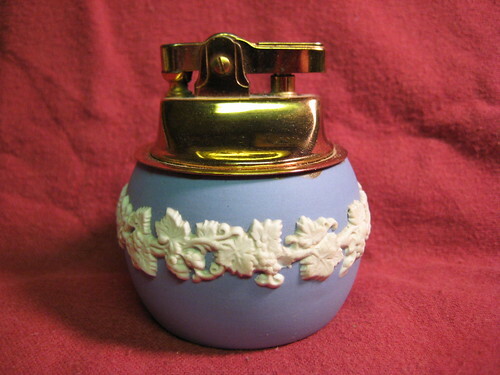 I enjoyed collecting table lighters primarily from the 30's and 40's, but this 1966 Ronson Jasperware Wedgewood table lighter was a special find. Like many people that become obsessive with their collecting, I had several guide books on vintage lighters and would sit and mark off the ones I owned, note when and where I bought them, and how much I paid for them. I'd also sit and look at the ones I didn't have, but desperately wanted to add to my collection. Case in point, the Ronson pictured above. I used to LOVE Wedgewood, and all of the tinier pieces that they produced, and I LOVED Ronson table lighters so it went without saying that I would HAVE TO HAVE this particular lighter for my collection. This was before I owned a computer, (or even knew how to use one) and before I knew of Ebay. If I was to find a new lighter for my collection, it was from a flea market, antique shop, auction or garage sale. So one day, I'm out driving in a slightly rural area. I see a sign for a garage sale, and pull over. It's a real garage sale in that it was actually being held in the person's garage. I get out, walk in, and see that there are shelves of antiques set up all around the inside of the garage. And then I see it. My mouth goes dry. I whisper to myself, "there it is...." I calmly walk over to it and pick it up to make sure it's not a replica, because there were many knock off's made to look like Wedgewood. It's the real deal, but this was no normal garage sale, this was a man selling antiques from his garage and he knew what both what he had and it's current market value. I paid him his $25 asking price because I'm not a good haggler. He could have asked me for $50 and I still probably would have paid it. It was just one of those things I just *had* to have. So now, a dozen years later, I have this lighter and it's wrapped in tissue paper, packed in a box in the attic. It's not a useful or practical object, and I no longer have a place to display it, nor would I really want to. It's just not important to me any more. It's sad that the current position of Wedgewood in administration means that items like this are likely to become rarer. I wish I knew. Decisive I'm not.